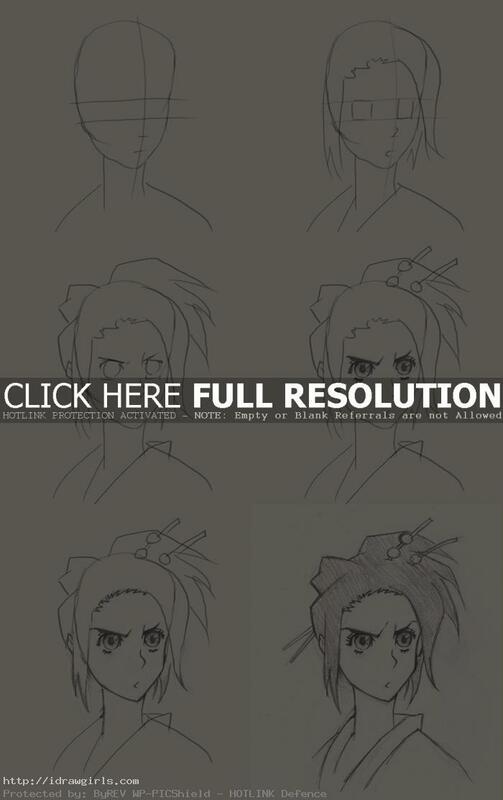 How to draw Anime character Fuu from Samurai Champloo. Learn to draw Anime girl Fuu with step by step tutorial with easy drawing instruction. 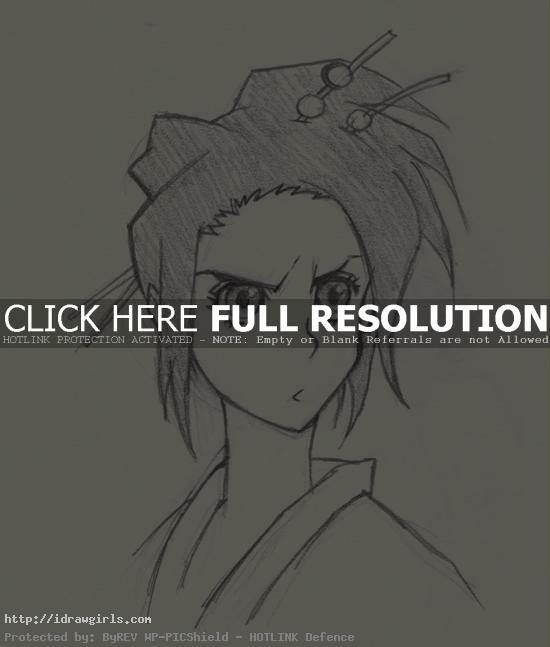 In this tutorial, you will learn to draw Fuu, an anime girl character from Samurai Champloo. We should first break down the drawing into simple geometry so it will be easy to draw over. Also it will be easy to understand the thought behind the drawing. Before you start to draw something new, you should observe the subject and break it down into a simplify version. It will make the drawing easier if the initial sketch is simple. That is the secret of getting a solid and good drawing. Though it might look simple but the most important part is measurement and placement of all elements such as space from right eye to nose bridge or from mouth to chin. Correct shape and positioning initial pieces within the drawing will make your drawing more accurate and more appealing. Once you get the shape and form you need to take the drawing to the next step, it will be easier to draw over with final line. It is a lot easier to draw if you carefully observe the over all shape of a subject you are drawing. Fuu (フウ) is a 15-year-old girl and the leading lady of the show. In her childhood before the beginning of the series, her father left her and her mother for unknown reason. Without her father around to support them, Fuu and her mother led a difficult life until her mother died of illness. After a not-so-successful stint as a teahouse waitress, she saves Mugen and Jin from execution and recruits them as her bodyguards to help her on a quest. She is searching for the “Samurai who smells of Sunflowers”, but never explains what a sunflower smells like or what the man looks like. Mugen and Jin are often reminded of their life-debt to her when they wish to fight each other, much to their chagrin. Her relationship with Mugen and Jin is apparently sororal. She often puts on a front of being more worldly and experienced than she actually is so as not to appear completely ingenuous in front of her bodyguards. Fuu wears a deep pink kimono with a pattern of flowers and carries a matching tantō. Here is a final drawing of Fuu. Below are step by step images how to draw Fuu. Step one, you have to make the initial sketch as simple as you can. The most important part is accuracy of placement among facial parts. Your drawing will be more solid if you have correct placement and measurement. Learn how to observe your subject well, then you will be better at drawing. Once all the shapes and forms are in their own positions, you can then take your drawing to the next step. It will be easier to draw final line over after. It is the easiest way to get the drawing solid.